St Michael le Belfrey occupies a broad plot on the southern side of Minster Yard, immediately alongside the Minster itself. Saxon burials in Petergate suggest that a church existed on this site as early as the eighth century. 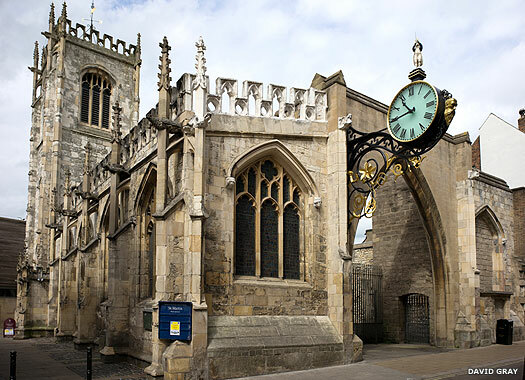 One certainly existed by 1294 and was controlled by the Minster's Dean and Chapter for several hundred years. The present church dates from 1525-1536, and 'le Belfrey' refers either to the Minster belfry or to the older church which probably had a bell tower. The church was a rebuild, although how much of the old fabric remained is uncertain, resulting mixed Gothic and Renaissance styles. 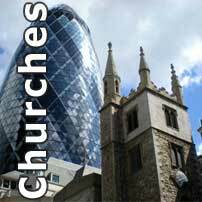 It remains the largest parish church in the city, originally serving a wealthy community of merchants and craftsmen. Guy Fawkes was baptised here in 1570. 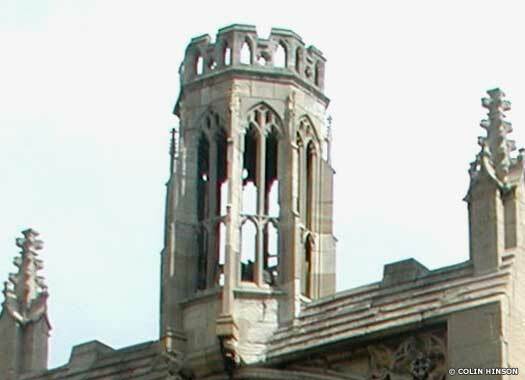 The 1848 bell tower is a replica of the earliest known tower, first shown in 1705. The west front was fully restored in 1867 after houses attached to the church were demolished. St Wilfrid's Catholic Church is on the northern side of Duncombe Place, overlooking Blake Street within sight of the Minster. 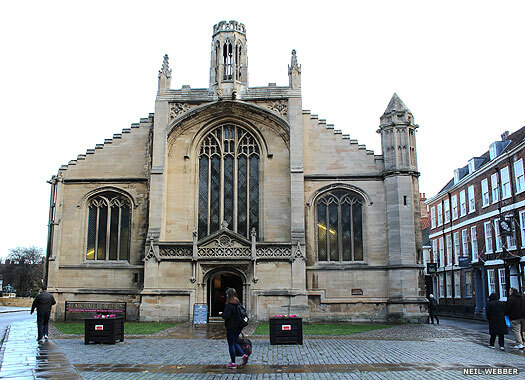 Opened in 1864, it was dedicated with the name of the former Anglican church in York which was closed in 1548. 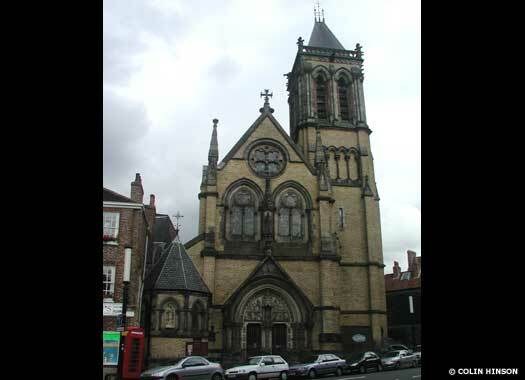 St Wilfrid's parish was revived by Catholics in 1742 with the founding of the Little Blake Street Mission. A public chapel opened in 1760 and continued until 1802 when another chapel was built on the present site and used until 1864. St Mary's Abbey stood on the land between Museum Street and Marygate, to the north-west of the Minster. 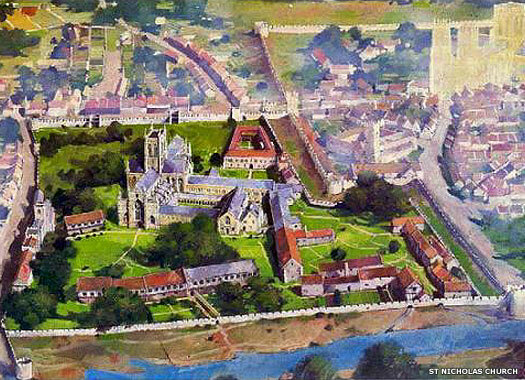 The abbey was founded in 1055 and initially dedicated to St Olave. William II re-founded it in 1088, and began the construction of a Norman church. Eventually the wealth of the abbey prompted the building of a much larger abbey church in 1270, which was completed in 1294. The old church was undermined by the foundation work and was demolished. 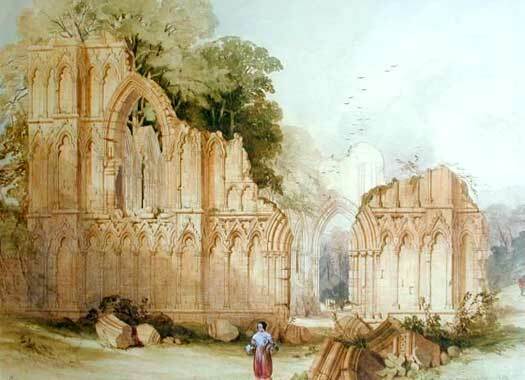 Following a dispute and a riot in 1132, a party of reform-minded monks left to establish the Cistercian monastery of Fountains Abbey. The surviving ruins of St Mary's date to the rebuilding programme begun in 1271 and finished by 1294. In November 1538 the Gilbertine Priory in Fishergate surrendered to Henry VIII during the Dissolution. The Benedictine Priory of Holy Trinity followed a month later. St Mary's was closed in 1539, and was quickly destroyed to a great extent. St Martin-le-Grand is on the western side of Coney Street, opposite New Street. Often known as St Martin Coney Street and most famous for the clock overhanging York's main shopping street, the church existed by the eleventh century. It was largely destroyed by bombing on 29 April 1942, but in the 1960s the surviving south aisle and tower were incorporated in a rebuilding on a smaller scale under the direction of the leading church architect, George Pace. Four photos on this page contributed by Colin Hinson.